The African Flower is a hexagonal motif that can be used to make a variety of items, such as afghans, potholders, purses, pincushions, pillows, and more. Once you make one of these motifs, you’ll find that they become very addictive and you’ll need plenty of them! The image to the left shows the motif made into a potholder. 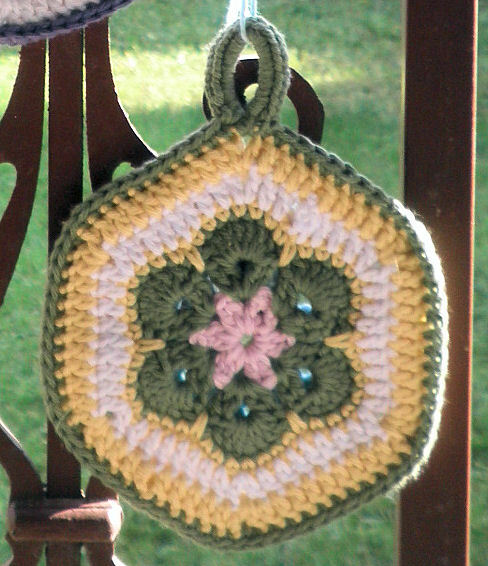 For color suggestions, see the Flickr Crocheting African Fowers Pool. Also see my working notes at the end of the pattern. I wish I’d seen this pool before I started making mine but I kinda like the colors I chose. Whenever possible, work ends into the piece as you go by crocheting around them. This will lessen the number of ends that you have to weave in later. Colors For a jewel-like piece, use black on round 5. This st is done on round 4 of the motif with the “spike” going down through round 2. Insert hook under ch-1 sp of round 2, hook yarn (do not yo), pull up yarn through ch-1 of round 2, yo, pull both lps on hk. Base Chain With A, ch 5, join with a sl st into a ring. Round 1 Ch 3 (beg dc here and throughout), dc in ring, ch 1, *2 dc, ch 1,* rep from * to * a total of five times, join with sl st in top of beg dc. Fasten off. Round 2 With B, join in a ch-1 sp, ch 5 (beg dc and ch-2 sp), 2 dc in same sp, *ch 1, 2 dc, ch 2, 2 dc in next sp,* rep from * to * four times, dc in same sp as beg dc, join with sl st in top of beg dc. Round 3 Ch 3, 6 dc in first ch-2 sp, ch 1, (7 dc in next ch-2 sp, ch 1) in next five ch-2 sps, join with sl st in top of beg dc. Fasten off. Note: This pattern uses the same color for two rounds, but if wanted, change colors for round 3. Round 4 With C, join in fifth dc of any petal, ch 1, sc in same st, sc in next 2 dc, sc spike st in ch-1 sp down to round 2, *sc in next 7 dc, dc spike st,* rep from * to * around, join with sl st in first sc. Fasten off. Round 5 With D, join with sl st in first sc after any spike st, ch 3, dc in next two sc, *(dc, ch 1, dc) in next sc (middle/apex st of ea petal), dc in next three sc, dc in spike st, dc in next three dc,* rep from * to * around to last spike st, join with sl st in to top of beg dc. At this point, decide if you want to join the motifs as you go or add the final round then seam them together. To seam the motifs together later, rep rounds 1 through 5 above for all motifs you need. To join-as-you-go, rep rounds 1 through 4 above for the next motif then join to the previous motif following the join-as-you-go tutorial linked above. I chose a total of six colors, plus white, then created a chart showing the center color (A), the middle color (B), and the range of outer colors (C). So, for a light blue center, I’d crochet 18 centers of light blue, then add green to three of them, then outer colors of light green, lt pink, and lt yellow. The next set would have light green added to the light blue centers, then outer colors of green, light pink, purple, and light yellow … and so on. I didn’t want two dark colors together, so the green and purple colors were never placed next to each other in sequence. In addition, I didn’t want the center color to be the outer color as well. Without the motifs with white centers, there will be 70 motifs. If the white centered ones are added, there will be 98 motifs (plus I can duplicate a few as needed to balance out any spaces). I found that I worked this best by first making all centers (A) of one color, then the petal round (B) for all centers. Then, I divided the pieces up based on the edging color (C) and added the edging for each color at the same time. This allowed me to make a minimum of 18 motifs each evening I worked, sometimes more. As I added each petal and edging color, I scratched it off my table to show they were done. Crochet 18 Lt Blue centers. Add Lt Pink petals to four blue centers. Add Lt Green petals to four blue centers. Add Med Green petals to three blue centers. Add Dk Purple petals to three blue centers. Add Lt Yellow petals to four blue centers. Add Lt Pink edging to four motifs. Add Lt Green edging to four motifs. Add Med Green edging to three motifs. Add Lt Yellow edging to four motifs. Add Dk Purple edging to three motifs. Add White for round 5.